We had a special event this past month honoring all missing persons, those yet unidentified and missing/victims of crime. 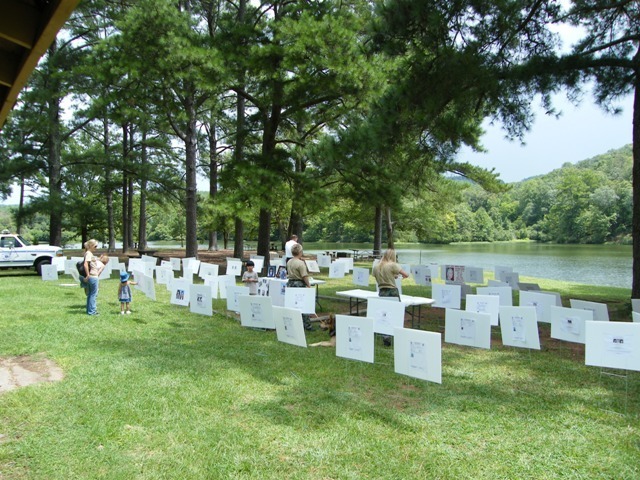 The Community for United Effort for Missing Persons stopped by Oak Mountain Park in Pelham, Alabama on 19 August on their On the Road to Remember Tour. All missing persons from the local area were recognized, each victim having their picture displayed with a synopsis of the circumstances surrounding their disapperance. The missing are from every race and every walk of life. We were all stunned by the shear number of poster pictures of those missing, unidentified and missing/victims of crime. There were approximately 100 posters from the Birmingham, Alabama area alone. It was a very sobering experience just to be there. A number of people spoke from Birmingham and the surrounding areas including representatives from the Birmingham PD, Homewood PD, search and rescue teams and others. Nadia was one of the featured cases. It gave us an opportunity to share her story and some pictures of her growing up. Several people commented that they knew she’s a mother but it hadn’t occurred to them that she is also a cousin, a granddaughter, a (soon to be) sister in-law and a sister. We shared words from her grandma, her grandpas, her brothers and Kevin and I. It was good to see dear friends who had made the drive to Pelham, AL to support all of us. We’re extremely grateful for all who were able to take a moment out of their day to join us. We’ve been missing Nadi for 10 months now. So many families have been missing their loved ones so much longer than that. I can’t begin to imagine carrying such a heavy heart for so long. Our love goes out to you. Nadia’s criminal case continues to move forward as more leads come in and the authorities move closer to completing the picture of what happened to her and if she may still, after all this time, be alive. For this we hold out hope. Thank you all for your thoughtfulness and your continued support as we move forward ever closer to finding you, Nadia. This entry was posted on Thursday, September 3rd, 2009 at 20:21 and is filed under Homewood Alabama, Homewood Police Dept, Missing Person, Nadia Kersh. You can follow any responses to this entry through the RSS 2.0 feed. You can leave a response, or trackback from your own site.